The Stingers women’s soccer team showed up to play in Friday’s thirteenth annual Erica Cadieux memorial game. Photo Elisa Barbier. 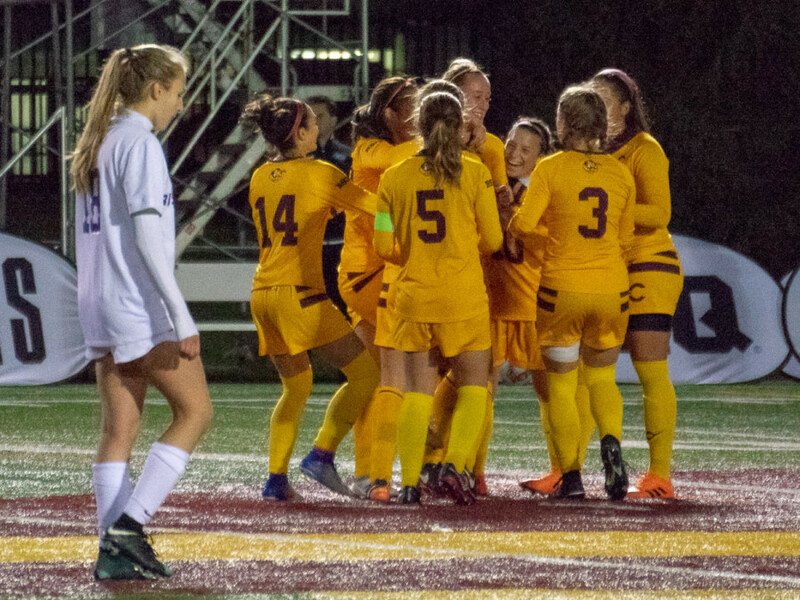 The Stingers women’s soccer team offered a strong outing to their fans in spite of the cold weather. 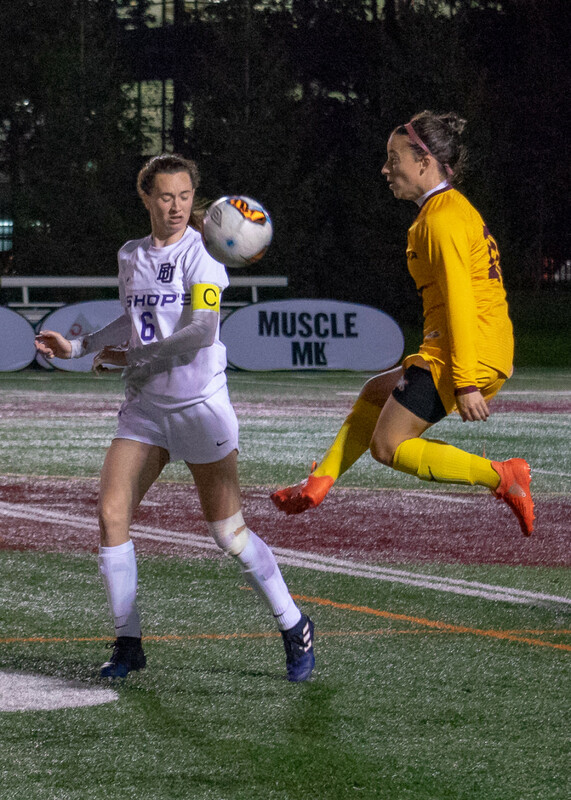 This matchup against the Bishop’s Gaiters marked the thirteenth annual Erica Cadieux Memorial game. 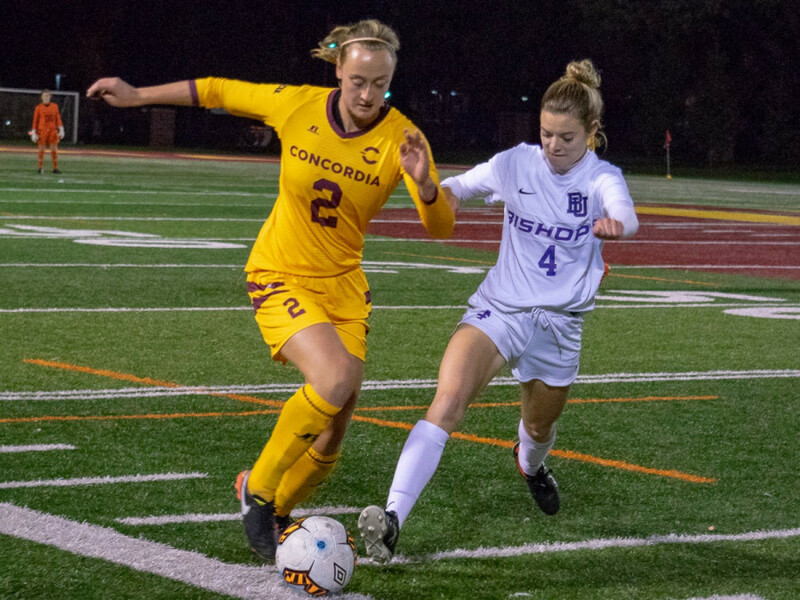 Missing a penalty early on, Concordia showed resilience and scored before the end of the half. Second-year player Claudia Asselin scored her fourth of the season on a quick play from a throw-in. Despite her missed penalty in the first half, third-year player Chama Sedki imposed her will on her opponents in her own territory. Her fast, physical play took many chances away from Bishop’s attackers. Coach Sutton had nothing but praise for his player. Evoy’s tally assured the Stingers victory as they were already dominating the pace of play at this point of the game. Even though it’s cliché to say so, every game is going to be critical for the women’s soccer squad until the end of the season. With a victory against UQAM this weekend, the Stingers would be one point shy of a playoff spot. Following Friday night’s game, a ceremony was held honouring the memory of former Stinger’s player Erica Cadieux. Members of her family were there to award the commemorative plaque to the winning side. Players from both teams were presenting gifts they had collected to give to Montreal’s Children Hospital. Kickoff for Concordia’s game against UQAM this Sunday is set for 3:30 p.m. on the synthetic pitch of Stade Saputo.